Before you start raiding the high-street and online shops, you need to understand what you're actually looking for. Want to learn the lingo? Just remember these few little points. Collar points: The end tips of the collar. Collar point length: The distance between the end tips and where they meet the collar band. Collar band: The piece of material that travels around your neck. 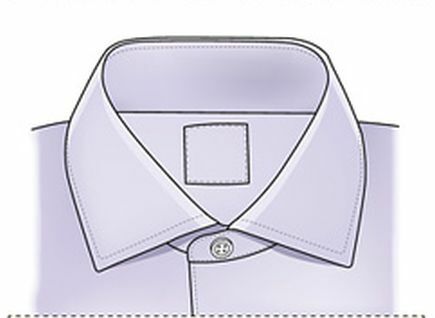 Collar height: The height of the collar (but only when it's been folded over). Tie space: The little space where your tie sits. Spread: The distance between one end tip to the other. You want to check every inch of your body and make sure the length is right. 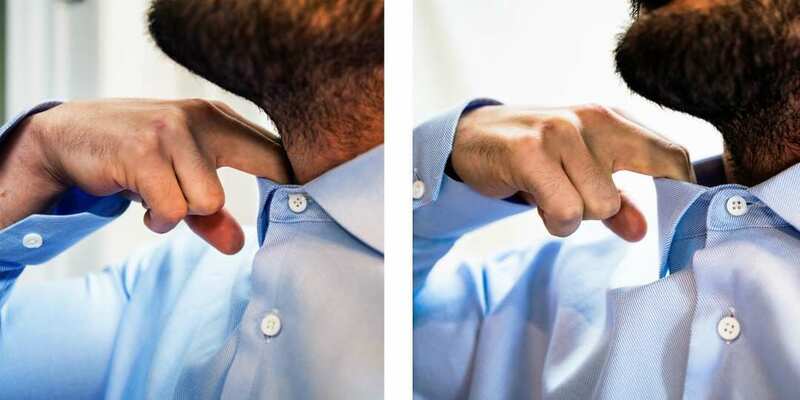 To avoid forgetting about the shirt collar, test out this little trick to ensure that it fits comfortably. Best part is that it only requires your two fingers! Take your index and middle fingers. Put them together. Try to fit them down the side of your collar. Check the amount of space that lies between. If you struggle to fit two fingers, then it's not the right size for you. However, if you can fit more than two fingers (even your whole hand) then it's way too big. Use this quick test to analyse your fit and go up or down to a size that feels best. 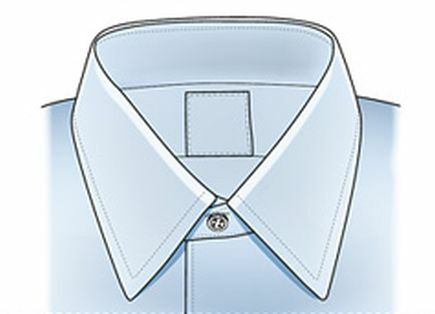 The forward point collar is one of the most popular shirt collars around and already features across 90% of men's shirts. You probably already own this style or if you don't, this is one of the best options to start with. This style is perfect for every occasion. If you're going to a formal event, you can pair this shirt collar up with a nice skinny black tie. 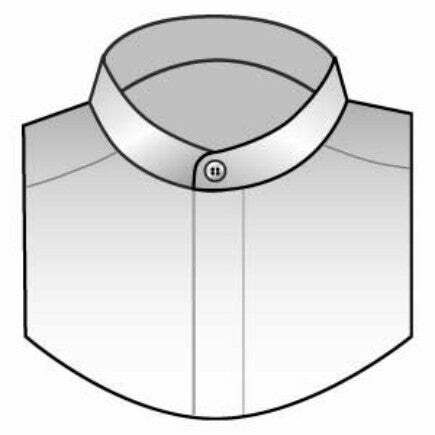 For more casual outings, you'll find that many shirts are designed using this collar shape, so you can simply leave it open. Not too much though, we don't want to see your chest hair! This shirt collar works best for those with round or oval face shapes. It's ultimately designed to frame your face and enhance your facial features. If you are blessed with a narrow shape, then you may wish to stay away from this one. The button down shirt collar is a great style for those wanting to update their look without trying anything too drastic. The added buttons help to create this classic look and can be perfectly matched with a pair of chinos and loafers. Recognised for its heritage. Versatile and great for both casual and formal events. Holds tie more securely. Achieves the smart look without accessories. Works well with jumpers. Despite the nature of your occasion, you should never open the buttons. The only time you should consider this is when attaching your tie, bow tie or ironing your collar. Otherwise, keep them closed as it'll only make your shirt look untidy. Are you looking for something more discreet? If so, you'll love its sister shirt - the Hidden Down Button. 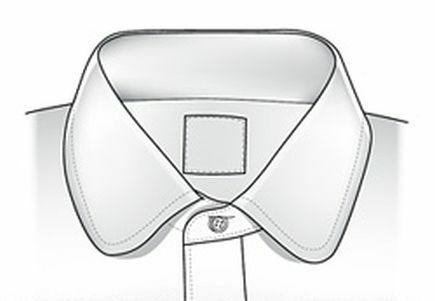 The buttons are secured away behind the collar, meaning that you have the option of wearing a tie. However, you need to still follow all of the same rules - no skipping! This style is considered to be versatile, so it's accommodating for a numerous amount of men. As its mainly worn without a tie, this can be a great choice for those wanting a more casual or sporty look. We're also beginning to see more dressier versions of this shirt collar, so keep your eyes peeled! This option is slightly more revealing compared to some others, as the wide neck area is more open. Think along the lines of Will Smith opposed to Simon Cowell. This shirt collar is great for staying formal without going overboard. Recognised for its larger width space. Perfect choice for larger tie knots. Powered by its origins (started in the early 1900's). Loved by business men. Accommodating for casual and formal occasions. With it's natural flare, you can choose from wearing a tie, no accessories or even open buttons. This shirt collar is all about celebrating your own style, so just go with the flow and choose what you like. If you decide to wear a tie, try to choose a large knot. 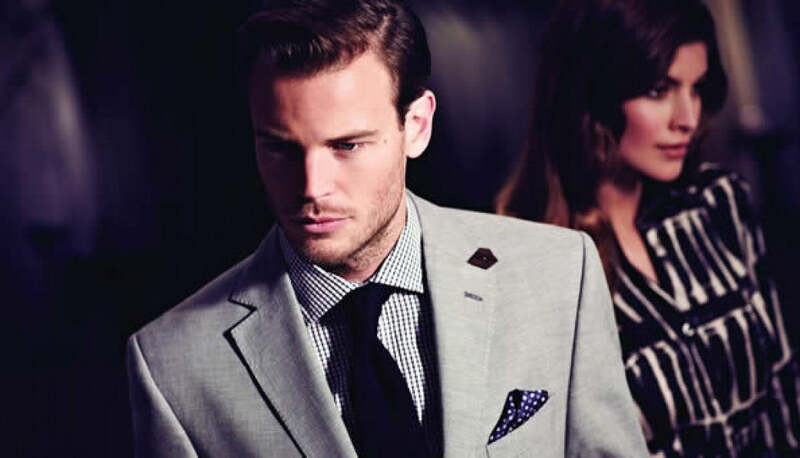 The Windsor Knot appears to be one of the most popular as it makes your shirt collar stand out more. This shirt collar works best for those with narrow face shapes or long and thin facial features. This style will help to keep your features in proportion and appear more flattering. Those with more round face shapes should be careful with this collar. You can wear it but you must keep the shirt collar unbuttoned and left open, so no ties for you! The neck band aka "The Grandad Collar" is taking the world by storm and becoming one of the top favourites. It's technically not a collar, as it's just a band of material, but we love it all the same. You'll find this style appearing in other similar styles such as T-Shirts and Polo Shirts. Doesn't look like a shirt collar. Works better with additional layers such as jumpers. Can be tucked in or left out. Looks great for both formal and casual events. Becoming a popular choice for men. This shirt collar also supports versatility, so it can suit any man. You can choose to leave the collar on show or hidden away under some layers, but it's really down to you. With the summertime on the horizon, this style is great for our unpredictable weather. You can roll up the sleeves and enjoy the sunshine or add some layers to stay warm. You don't need to worry as this style doesn't require a particular face shape. This shirt collar is all about making your look appear effortless and casual. If you prefer easy styling? Then this has been made for you! This shirt collar has to be one of my favourites as it screams fun, style and oh so, posh! Known for its sophisticated flare, you won't help but feel part of the upper class while wearing this one. Anyone for a spot of tea? Known for its rounded collar shape. Christened as the 'club collar' due to its elite history. Most popular style to pin down. Enhances your facial features. Appears more expensive. This shirt collar loves getting pinned down. Use collar stays (I'll explain them soon) to help ensure that it stays stuck down. Attach your favourite tie to update your look. This is also a great option for formal events and those who belong to an elite club. Unlike the band collar, this one will not suit everyone. This style is best for those with thin face shapes as this shirt collar enhances those areas. So, those with rounded facial features? I'm sorry, but this one isn't for you either. This shirt collar is the fanciest of the bunch, so it's perfect for your suits and tuxedos. With it's resemblance to wings, this one is perfect for weddings. It will make you to look stylish on your big day and literally help those worries fly away. Recognised for its likeness to wings. Early origins (1900's). The most classic style. The go-to choice for weddings and all formal occasions. Designed to hold bow ties. 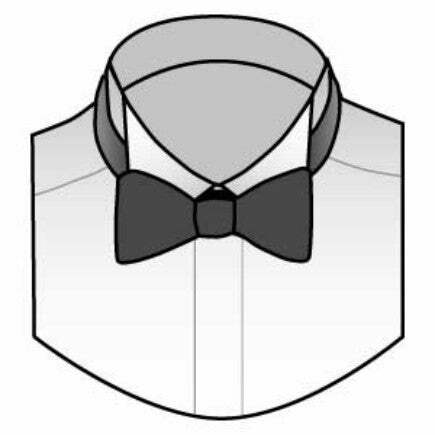 There's only one way to wear this shirt collar and that's with your suit or tuxedo! You don't need to worry about the positioning of the wings as they're designed to be elevated. To enhance your style, add a bow tie rather than just an ordinary tie. Go all fancy with this style as you only get married once (or so they say!). For all you rule breakers, why not change tradition by wearing this style whenever you fancy. Just make sure that you pair up your look with other formal pieces and go easy on the colours! Absolutely everyone! I think every man needs this shirt collar in his wardrobe!